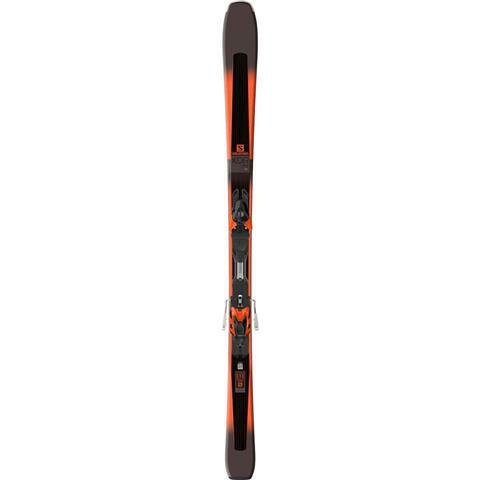 The new Salomon XDR 79 CF Skis + XT10 Bindings are just what you need to gain a confident edge all over the resort. Designed with a precision-focused 79mm waist and a versatile modern rocker line, this ready-to-ride combo can link carves on the groomers, float through that off-piste refresh layer, and charge through variable snow without hesitation. Plus, with a single Ti layer these skis promise to be lively and chatter-proof for many seasons to come. All-Terrain Rocker 2.0 – Delivers a combination of precision and maneuverability. Easy and precise steering with great terrain absorption. All-Mtn C/FX Shape – Reduced width in the tip and tail for improved maneuverability. Woodcore – The addition of wood in the core creates stability on snow and rebound. Smooth ski/snow contact and filters vibrations. C/FX Transversal Carbon – A new weaving with transversal and longitudinal fibers. Yields increased torsional stiffness, stronger edge grip and stability. Single Ti Laminate – A single layer of titanium reinforcement. Provides great edge grip, efficient energy transfer and liveliness.